Villa Damy y Roman provides accommodation in Viñales. 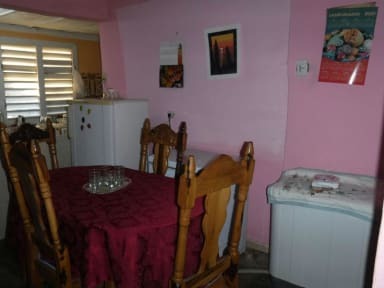 Featuring a restaurant, the property also has a garden.24-hour front desk.A continental breakfast can be enjoyed at the property.Also we provide Spanish language classes.Salsa Dancing lessons.English spoken.Gatronomic service(Breakfast,lunch and dinner).Cuban and international food. Set is Vinales It is a quiet place but at the same time with easy access to all the services offered by the city. Also, close to several tourist centre and attractions. Check out from 00:00 to 00:00 . Breakfast not included - 5 CUC per person per day.